These cute little hearts are perfect for Valentine's Day! 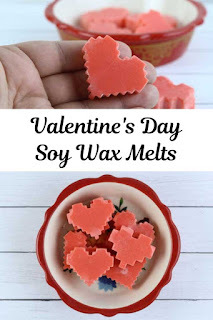 Learn how to make soy wax melts for Valentine's Day or any day with this DIY tutorial. 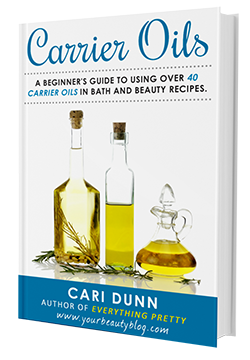 I used a natural chocolate fragrance oil, but you can use essential oils. Valentine's Day will be here in just a few weeks. 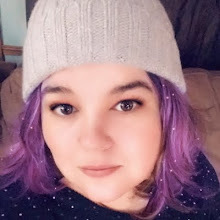 After the snow that got dumped on us last weekend, I'm ready for the cute and fun holiday to arrive. We only got about 6 inches of snow on Saturday, but the drifting has been really bad. There are drifts up to 5 feet tall on the roads, so we've been stuck at home. I heard the roads are getting clearer each day, but there's now a layer of ice below the snow. 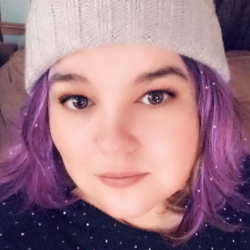 So we've been at home playing board games, baking yummy things, and trying to stay warm. Since we've moved past the Christmas scents, I wanted to move into some fun scents for Valentine's Day. 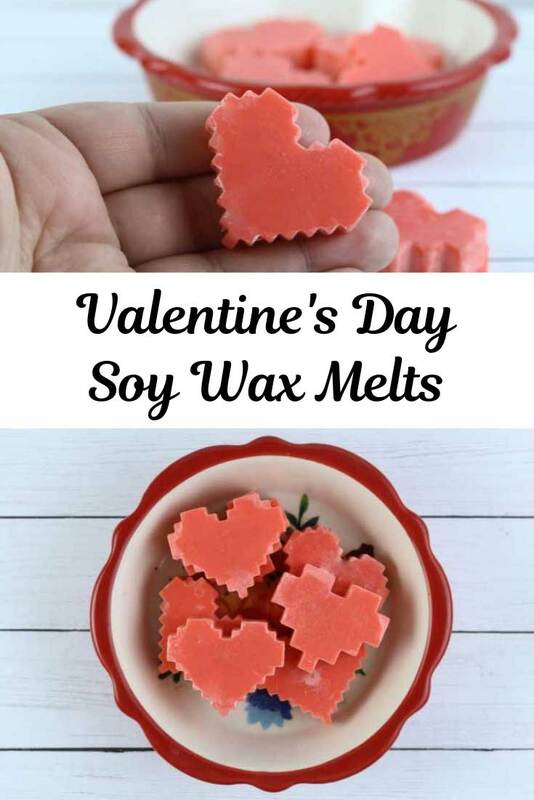 I decided to use this new natural chocolate scent that I picked up last month to make these soy wax melts for Valentine's Day. 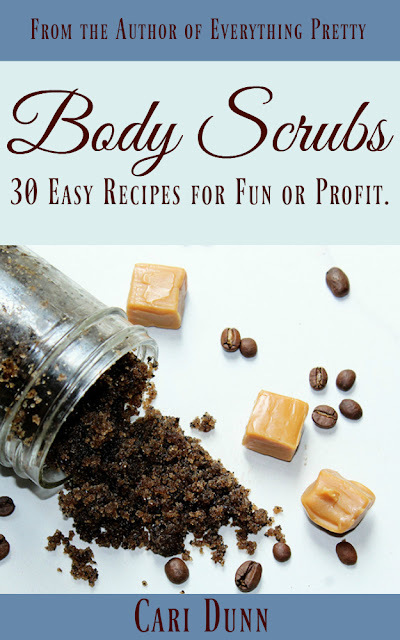 For this recipe, I kept it simple and calculate for one pound of wax. You can make this recipe bigger or smaller with a few calculations. I actually used three ounces of wax, so I decreased the scent and stearic acid by one fourth. I knew I wanted a few wax melts, but I wasn't really picky on how many I made. If you want to make an exact amount, find out how big your mold is and melt that much soy wax. Not all molds are marked. The mold I used isn't marked, so I couldn't use that method. 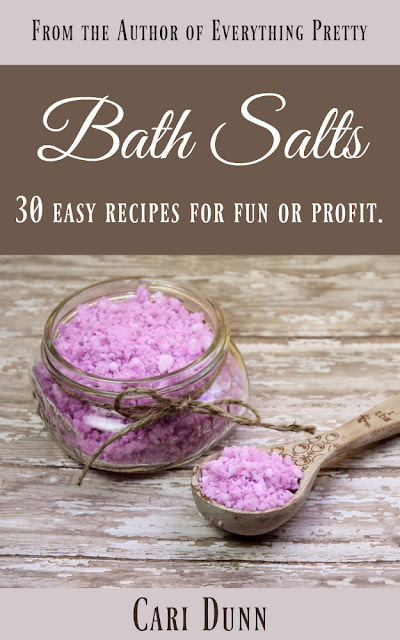 You can also fill an 8-ounce measuring cup with water and pour it into the molds. Once they are full, see how much water you used. That's how much soy wax by weight to melt. Or you can fill the mold with soy wax flakes. Weigh the wax and then double it. That should be very close to what you need. I always keep little souffle cups handy when I'm making soaps and waxes. If I have extra, I pour it in there and give it to friends or keep it for myself. It may not be pretty, but it will work just fine. I used Crafty Bubbles soy container wax. I've been using it since I sold wax melts years ago, and it's my favorite to work with. Soy wax generally doesn't have as good of a throw as paraffin wax, but this one does have a good throw. I use soy because it's more natural than paraffin wax. I also live in the country, surrounded by corn and soy fields. I'd rather buy something that's not only renewable, but is also supporting my neighboring farmers. I used a container soy wax, so I added some stearic acid. If you are using a wax made for molds, then you won't need to add anything. Stearic acid helps wax shrink as it cools. If you've ever used a wax melt and had to scrape it out of your burner, they didn't add stearic acid. 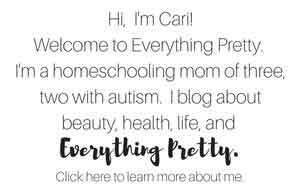 I use stearic acid in other recipes like my peppermint mocha whipped salt scrub recipe, so I always have it in my stash of supplies. Vybar is probably more popular to add to candle wax. It helps the wax release from the mold because it hardens the wax, and it helps with scent throw. 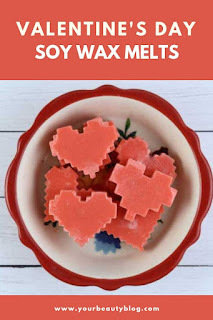 I really like using silicone molds for my soy wax melts because the tarts unmold easier. You can use a mini muffin tin or pour directly into a clamshell mold . I picked up this Nerdy Nummies 8- and 16-bit heart mold that's perfect for Valentine's Day. Being the geek girl that I am, I had to have it! You can get just the mold as an add on or buy a two pack of molds in a kit for a little more. I picked up a chocolate natural fragrance oil at Bolek's Crafts in December. This isn't an essential oil, but it is all natural. You can check out their Facebook page for ordering information. You can also use cocoa absolute . The Crafty Bubble chocolate scent is $4 for half an ounce. Cocoa absolute is about $20 per half ounce, so it's a considerable savings to order it from Bolek's Crafts. The throw on this chocolate scent is amazing! And it smells just like you're baking brownies. It's a true chocolate scent and not fake. You can also use a fragrance oil or essential oil. You'd use the same amount per pound of wax for most scents. Some scents like cinnamon or peppermint are very strong, so you should use about half as much. If you want to add more, make a note for the next time. Use a digital scale to measure your soy wax. I put mine in a 2-cup Pyrex measuring cup because I only melted three ounces for this project. I don't have a double boiler, so I make my own. I set a canning ring in a pan of water. Then I set the measuring cup on top of that. This lifts the measuring cup up so it's not on direct heat. Fill the pan with enough water to cover at least half of the wax. Be careful not to get any water in the wax. Carefully remove the measuring cup from heat or if you are using a double boiler remove the top pan. Set on a hot pad. Use a laser thermometer to check the temperature of the soy wax. When it gets below 180 degrees, add the fragrance. Add the colorant if you are using it. Stir well. If you used stearic acid, it has a higher melting point than does soy wax. You can see that I got some white streaks. That's from the stearic acid. Carefully pour the soy wax into the molds. Let sit until completely cooled before unmolding. And how you know how to make soy wax melts! How cute are these little 8- and 16-bit hearts?? Technically, soy wax melts don't need to cure, but I let them cure for a few weeks anyway. There are some scents (this chocolate is one of them!) that are very strong from the day you pour it. Other scents get stronger a few weeks after you poured. So for best results, I just factor in some curing time before I use them. Use a digital scale to measure your soy wax. Add the stearic acid or vybar. Pour into molds. Let cool completely. If you used stearic acid, it has a higher melting point than does soy wax. It can cause white streaks if it's not melted, but it won't harm your wax melts.